Nearly three decades ago, Tabbing Thomas was employed in a print shop, aligning four-color separations for glossy magazines and living a proletariat life at far remove from the world of ideas in which he truly dwelt. 1984 arrived, setting in motion changes to Thomas' world that made phototypesetting, tabbing and so much else the technologies and practice of hazy memory that they are today. In his rather cloistered life of the time, Thomas imagined a world of information and ideas freely shared, connected in new ways which a few dreamers had conceived before but which Bill Atkinson's HyperCard made accessible to the masses. 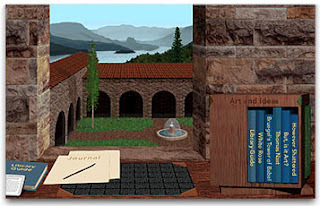 He created what I believe to be the first public hyperbook from the English text of De Imitatione Christi by Thomas à Kempis; this later grew into a virtual monastery library with diverse volumes from Thoreau and others as well as original art essays and windows on history such as The White Rose and paranoid speculations on the Kennedy assassination. If Monks Had Macs was a project of breathtaking originality and scope in the late 1980s; I was one of many captivated by it, contributing technical skills to support the creative vision of Brian Thomas, the project's architect. The project is now available free on the Rivertext website. Looking at its many odds and ends, one might ask questions like Why an e-book reader? There are so many of those! Ah, but not twenty years ago; this was one of the first, long before the rise of Amazon and the commercial wave. HyperCard and the Monks project have largely passed into digital history now. And sadly, in the quarter century of the virtual library's existence, the physical libraries that older translators grew up with have suffered great declines in very many cases. A recent New York Times essay cluster asked whether we still need libraries and what their roles should be today. My reflex is to shout Of course we do! and call for continued support of these institutions as I knew them and as most have ceased to exist. Does this really make sense? Card catalogues? When was the last time you used one? I think the last time I found myself in an institutional library was eight years ago at the Bodleian in Oxford. A scary thought. This is not entirely by choice, but over the years I found it increasingly difficult to use community libraries which were mostly shuttered and open but a few hours in the week. When the doors were not barred I could still lose myself in the stacks for most of a day, but now I do that in the poor substitute of commercial bookstores which are usually clever enough to provide plenty of comfy chairs and a coffee bar. I've spent many weeks of my life thus at Powell's in Portland and Alexandra in Budapest. Some capitalist souls cry out for the abolition of libraries altogether for the damaging influence they exert on bookshops, video stores and Internet cafés. No kidding. Read some of the insane comments for those New York Times articles. When I consider the economic and intellectual misery of the village where I currently live in Brandenburg, Germany, I cannot help but remember how libraries have helped individuals without other access to education and ideas to reach for better. My naive imagining of the library is an educational institution of equal stature with schools and universities. And in many places I am sure it plays such a role in often unique and creative ways. But not often enough. How will we see libraries a decade from now? In fifty years? I cannot extrapolate the current trends of virtualization and see structures which offer substitutes for some of the very tangible things libraries once offered me and still can. But in an age when words of Alexandrian scope or greater fit on a thumb drive, how can we persuade budget-strapped public administrations and their tax-allergic subjects that libraries are a relevant common enterprise worthy of investment? Imagine.